But today the staff of the special commission investigating the disaster issued four papers that fault the administration’s handling of the oil spill. The Obama administration’s response to the BP PLC oil spill in the Gulf of Mexico was affected by “a sense of over optimism” about the disaster that “may have affected the scale and speed with which national resources were brought to bear,” the staff of a special commission investigating the disaster found. The four reports created by the National Commission on the BP Deepwater Horizon Oil Spill and Offshore Drilling,blast the Obama administration for making inaccurate public statements about a report on the fate of oil spilled by a BP well in the Gulf of Mexico. The commission papers also are critical of the administration for initially underestimating how much petroleum was flowing into the Gulf. Together, the inaccurate statements created the impression the government “was either not fully competent to handle the spill or not fully candid” about the accident. The paper faults the administration for taking “an overly casual approach” in calculating, during the spill’s second week, that between 1,000 and 5,000 barrels of oil were flowing in to the Gulf. According to the commission those figures were based on a one-page document prepared by a government scientist within six days of the April 20 explosion. The scientist’s estimate was based partly on an imprecise estimate of the speed with which the oil was leaking and didn’t account for a leak from a kink in the riser above the rig’s blowout preventer, according to the spill commission investigators. That estimate was later revised to between between 35,000 and 60,000 barrels a day—Deepwater Horizon rig, according to a commission staff paper. “Despite the acknowledged inaccuracies of the [government] scientist’s estimate and despite the existence of other and potentially better methodologies for visually assessing flow rate…5,000 bbls/day was to remain the government’s official flow-rate estimate for a full month until May 27, 2010,” the staff paper says. In documents released Wednesday, the national oil spill commission reveals that in late April or early May the White House budget office denied a request from the National Oceanic and Atmospheric Administration to make public the worst-case discharge from the blown-out well. 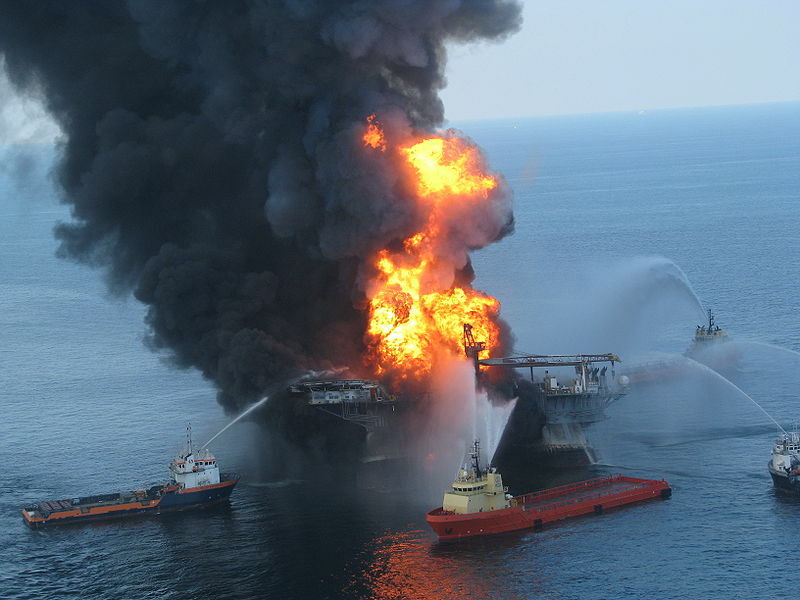 BP estimated the worse scenario to be a leak of 2.5 million gallons per day. The government, meanwhile, was telling the public the well was releasing 210,000 gallons per day – a figure that later grew closer to BP’s figure. The commission also says the administration responded from a political perspective and did not listen to the people working the cleanup and they may have lied about their most recent projections being peer-reviewed. The tripling effort resulted in resources being thrown at the problem in an inefficient way. For example, the commission paper says, the National Incident Command staffers thought they needed to buy every skimmer they could find, even though they were hearing that responders had enough skimmers. The commission staff also takes the administration to task for having characterized a federal report on the fate of oil in the Gulf as having been subjected to “peer review” by independent scientists. In fact, the commission staff paper says, it is unclear whether any independent scientists actually reviewed the paper prior to its release in August. The paper said that about three-quarters of the oil spilled by the well had broken down or been cleaned up. Those estimates have been challenged as overly rosy by some independent scientists. While BP’s then CEO Tony Haywood testified before Congressman Waxman, the progressive legislator said the common thread behind all of BP’s decisions was they saved BP time and money but raised the risk of catastrophe. “BP has cut corner after corner to save $1 million here, a few hours or days there, and now the whole Gulf Coast is paying the price,” said Waxman. BP’s CEO, Tony Hayward kept answering over and over that many of those decisions were approved by the the US Minerals Management Service. And indeed they were. Now we find out that the big lies were not made by BP, but it was the administration, who covered up the extent of the disaster. The blame for this falls squarely on the lap of President Obama.